In several regions of the country, spotted bass are overlooked by anglers set on catching largemouths or by purists seeking only smallmouths. But in top locations, spots combine the best features of both fish. Indeed, many characteristics are intermediate between largemouths and smallmouths, so much so that ichthyologists regarded the spotted bass as a hybrid or type of smallmouth until the 1930s. The original range of spotted bass included all the lower and central Mississippi River drainage from Missouri and Kansas to Louisiana and Mississippi, as well as the Gulf Coast drainages from the Chattahoochee River in Georgia to the Guadalupe River in Texas. The Ohio River drainage from West Virginia and North Carolina through Kentucky, Indiana, and Tennessee also was home to northern spotted bass. The species was absent from the lower Mississippi River, possibly due to excessive turbidity, and they don't enter tidal sections of coastal rivers. The epicenter of spotted bass range seems to be the central Mississippi drainage. Ichthyologist theorize they spread east, south, and west from there. Alabama spotted bass were brought to California in 1974 and their success there led to stocking in other western states. Today, 24 states contain spotted bass, and they keep getting bigger. Six states set new records in this decade, and California rules with a 10-pound 4-ounce beast from Pine Flat Reservoir. The Wichita subspecies of spotted bass, feared extinct by some ichthyologists, occurred only in streams of the Wichita Mountains of Oklahoma. The Alabama subspecies inhabits the Mobile Bay drainage in Alabama, Mississippi, and Georgia. The northern subspecies or "Kentucky bass" is most widespread. Analysis of mitochondrial DNA has led some geneticists to conclude that Alabama spotted bass are a full species, more closely related to redeye bass than to northern spotted bass. A scientific paper published in 2008 dubbed the new species Micropterus henshalli. In any case, they're a superior gamefish, outgrowing largemouths in shared waters and testing the tackle of bass anglers lucky enough to encounter them. Spring patterns: The Prespawn Period offers a predictably good bite, as fish mill along the edges of flats sloping from 2 to about 10 feet of water, along rock and gravel points, in natural brush along creek channels, and in manmade brushpiles. As reservoirs warm, spotted bass leave the main river and enter large sloughs and side channels, eventually spawning on flats or steep cuts. Four-inch ringworms or 5- and 6-inch straight-tail worms Texas rigged with 1/8- and 3/16-ounce slipsinkers excel, though Carolina rigs account for some big fish, often females holding a bit deeper along channel ledges. Drop-shot rigs also are deadly on deeper fish. Heavy, compact jigs tipped with craws work well all year, as do shaky-head jigs backed with straight-tail worms. Summer Patterns: The shallow nature of spotted bass in the prime impoundments on the Coosa River in Alabama, like Logan Martin and Lay Lake contrasts with Lake Lanier, Lewis Smith Lake, Pine Flat Lake, Lake Shasta, and most other top waters for this species. Water clarity seems to affect preferred depth. On the relatively murky Coosa system, a productive tactic is skipping worms and jigs under boat docks where 3- and 4-pound spots spend sunny summer days. And they've been known to blast a buzzbait worked through patches of smartweed along river channels. Deep-diving crankbaits are another good choice when spots hold along mid-depth ledge in the 10- to 16-foot range. 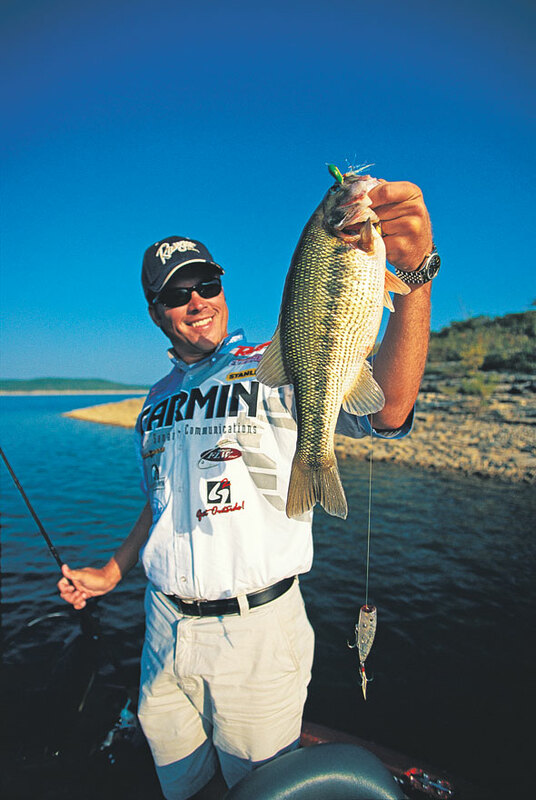 In clearer lakes like Lewis Smith and Lake Martin, also in Alabama, large spots typically move below the range of crankbaits in summer. In general, downsizing baits helps catch more spots by matching their prey size preference and smaller mouth, compared to largemouth bass. Spots seem intrigued by sound, hitting rattlebaits, noisy crankbaits, and softbaits presented with brass-and-glass setups. In spring and summer, spotted bass often feed on the bottom, but also form schools to pursue shad in mid-water or toward the surface. This has become a common phenomenon in California's clear impoundments where imported Alabama spotted bass have prospered and grown to world-record size. Here anglers fish big ripbaits and bounce large topwater walkers like the Zara Spook, Rico Suave, and Paycheck Repo Man to entice schools of roaming spots called "wolfpacks." Six- and 7-inch swimbaits account for some huge fish, though trailer hooks often must be added to hook them efficiently. To attract spots to the surface, position the boat over deep water and cast across underwater humps or stands of submerged timber. Work baits fast to trigger bites. Where spots hold along steep rocky breaks, work lures parallel to the bank or break, with each cast progressively deeper. In warm clear water, they're known to rise from 15 feet to smack a bait on or near the surface. Fishing at night is another option for spotted bass in summer. Like other black bass species, spots roam from cover at night and feed consistently, particularly in clear impoundments like Lake Lanier, Georgia, where Patrick Bankston caught the former state record spot weighing 8 pounds 1/2 ounce. After dark, worms, grubs, and finesse jigs work well around brush and stumps, along with spinnerbaits, crankbaits, and bladebaits. Fall and Winter Patterns: Since spotted bass don't tolerate extreme cold as northern largemouth and smallmouth bass do, their aggressiveness in cool and cold water is surprising. In early fall, summer patterns hold, but as water temperatures fall into the 50°F range, spots move deeper, whether the habitat is bluff banks, creek channels, offshore humps, or boat docks. Along bluff banks, spots may suspend between 20 and 30 feet in southeastern waters, sometimes deeper. Shad also have shifted deep at this time, attracting voracious spotted bass. It's often critical to find baitfish before starting to fish. If bait doesn't show on sonar, concentrate on rockslides along bluff banks, transitions from bluff to more gradual shoreline, and bank cover like boulders or fallen trees. Where timber remains along creek channels, spotted bass may hold in tree branches 10 to 30 feet off bottom. They're hard to pick out among the limbs, even on top-end sonars. Texas-rigged worm, grubs, and hair jigs drifted through the school usually tempt a few biters, but spots soon become wary. Jigging spoons imitate shad well, and excel for working deep structure. Experts watch from above on sonar, testing the reactions of fish to various jigging motions. When one is hooked, schoolmates often accompany it upward. In some cases, winter spots hold deeper than 50 feet. Pulling fish to the surface from this depth is known to cause barotrauma, physiological damage to tissues caused by rapid change in depth. At times, fish float on the surface, their eyes and gas bladders distended. In other cases, fish may swim away but suffer less obvious problems. Where anglers encounter extra-deep bass, it's best to catch a couple, then leave the school, particularly if fish have difficulty submerging. If a few fish exhibit problems, take them home for a meal and quit the pattern. Spotted bass are notoriously good-eating fish, due to their clear-water habitat, offshore existence, and muscle-bound frame.